Do you remember Alfred William Hart or his Pontypool friends? I’ve just received an email from Kate Tressider who also provided me with a photograph of six young men, one of whom is her Great Uncle Alf. Below I reproduce her email and also a copy of the photograph. If you recognise anyone on it please either make a comment or email me and I will pass on the information. I came across your wonderful website and thought I would send you an email. I have a very long line of ancestors from Pontypool and the surrounding areas, dating way back to the 1800s. I have recently been researching my family history, and have found, among many other things, the attached photograph. 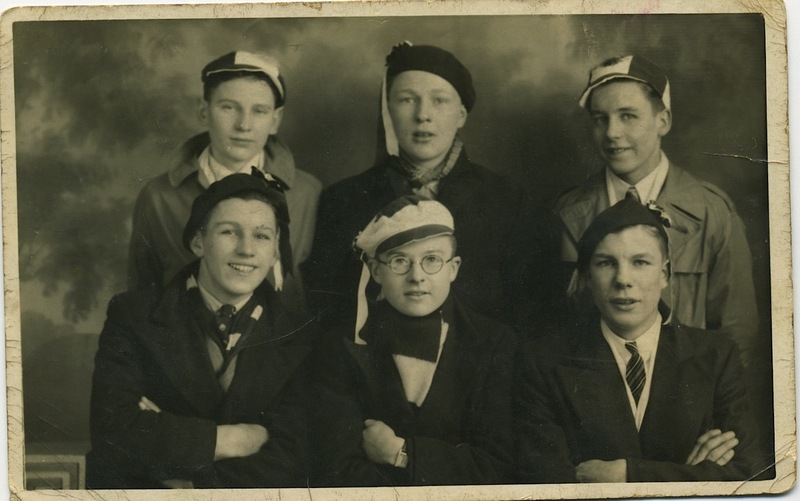 The photograph is of my Great Uncle (Alfred William Hart – pictured on the top right hand corner, turned slightly inwards, with the striped hat on) He was born in 1922, so I would estimate that this photograph was taken between 1934-1940… I would love to know if there is anybody who recognises the other people in the photograph, or if they have surviving ancestors. My Great Uncle was known as Alf to his friends; sadly he died in the Second World War on 8th June 1944; he volunteered to join the Royal Navy in 1943. He had an older sister, Irene, who was born in 1920. They lived at 19 Crumlin Street (Pontypool) with their grandparents. I would be very grateful if this could be added to your website perhaps? Let me know if there is any other information that you think would be helpful – and apologies that I can’t provide much more at the moment.